1 What is SuperComputers ? 3 Why SuperComputers runs Linux ? [dropcap]A[/dropcap] supercomputer is a computer with a high-level computational capacity compared to a general-purpose computer. Performance of a supercomputer is measured in floating-point operations per second (FLOPS) instead of million instructions per second (MIPS). 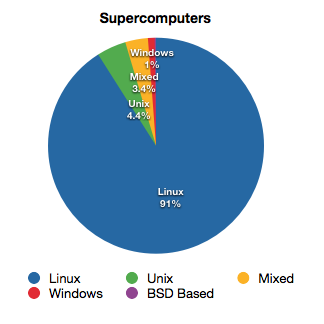 Why SuperComputers runs Linux ? Linux is just not an Operating system it is made by a small pieces of code. Each code block perform it’s own work. While all code blocks work together to make a operating system. Other operating system, specifically Windows gives freedom of customization to the Limited level. But in Linux you can modify as your needs. so it is used on supercomputers and it power-up the most or the servers around the world. If you take WebCheerz as example. we’re using Linux Server. Also Read: Why Linux is Better than Windows ? Linux kernel is generic, as much as possible. Single Source code that helps to run super computer to small handheld devices. For Example Android is based on modified Linux Kernel. There is no need to make large changes to the kernel in order to run on larger systems or smaller systems. Typically Linux kernel can be modified to be as small as 2Mb or as large as 1GB. Linux is fully Open source & it’s complete source code is available everyone. So that supercomputer administrators can customize the OS to any level as they want. In case you find any Bugs, Security LoopHoles you can fix yourself and run without any fear. Instead of hiring any third party developers. Linux doesn’t need any larger hardware resources and doesn’t have memory-draining softwares such as antivirus that impact negatively its performance. As Linux is OpenSource and Freeware. There are Lot of Communities which supports Linux. And you can get help from them. Linux is much more cutsomizable. It can be anything you want it to be, from a desktop to a server, laptop to a tablet, my house to US Army rifles. It’s meant to be everything, and it’s damn good at it.